Many people, particularly those who aren’t familiar with finance or banking, find it confusing to close their current bank or savings account. In cases where they are asked to write an application for closing bank account in the form of a business letter, they will be at a complete loss. While it is usually possible to find a form to open an account for a particular bank, there will not always be a form to close it, leaving you to create your own application for close bank account. Most of the time, you will need to write out a formal letter and give it to the branch manager of your bank in person when you want to close a checking or savings account. If you aren’t sure how to write this application to close bank account, then keep reading. If you are looking to close a bank account, keep in mind that your bank will make every attempt to stop this from happening as they don’t want to lose you as a customer. This is the main reason why you will find forms to open your account but no official application for closing bank account; they don’t want you to leave them. In many cases when you let a bank know that you want to close the account, they will tell you that you can keep it without a balance and don’t actually need to close it. If, however, you want to ensure that no one can access your account or want to stay on top of your financial planning by closing unnecessary accounts, you will want to take steps to create an application to close bank account. Before you start writing the business letter, talk to the bank to make sure you know what their requirements are. Some banks, for example, may charge you a closing fee, while others will require you to come into the branch with photo identification issued by the government. After you have determined your bank’s specific requirements for closing your account, it is time to write a letter to your bank’s manager to close the account. This is simply a piece of paper with a letter to the manager that requests that he close your bank account. Although the letter can take several different forms, there is some specific information that should always be included. 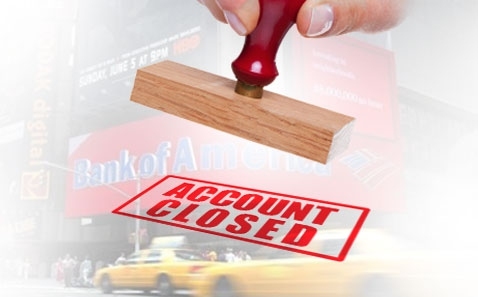 You will want to begin by addressing your application for closing bank account to the branch manager at your location, citing “closure of bank account” as the subject, possibly specifying “checking account” or “savings account.” After this, you will need to include the details of your account, including the following information as it appears on the bank records: name, contact number, email address, postal address. You should also include your account number and the CIF number if you have it. You should then go on to state why you plan on closing your account, mentioning when and why you opened it in the first place. Be sure to mention that you will return your credit card, debit or ATM card, check book, and passbook to the bank and ask the branch manager to cooperate. Be prepared to bring your photo ID with you when you give the letter to the branch manager, or to provide them with a faxed or scanned copy upon request if the letter is submitted via mail. This letter is to request that you kindly close account number ____, CIF _____, with your bank, which is under the name of (your name in full), resident of (your postal address), which has been held at this branch since (date of account opening). This account was inoperative over a long period and I regret that I cannot continue. I am returning my credit card, ATM/debit card, check book, and passbook to the bank. I request that you please provide me with a demand draft covering the existing balance and thank you for your cooperation through this process. You can connect me at (phone number) or (email address). This letter is to inform you of my wishes to close my account with your bank. I have listed the details of the bank account in question in addition to the numbers associated with the unused checks. There are no checks under these accounts awaiting clearance. I kindly request that you put the remaining account balance in a check, mailing it to the postal address associated with my account. If it would be more timely, I request you to please transfer the remaining balance to my new account with ___ Bank, with the account number _____. If you have further queries or require additional information, feel free to contact me via email at (email address) or call me at (phone number). Thanking you for the assistance given. Keep in mind that this application for closing bank account applies only to close current checking or savings accounts. If you would like to close deposits which are fixed or recurring, you will need to discuss this with the bank staff. Most of the time, you can close deposits done via online banking through the bank’s website. In most cases, you will still need to follow this process when closing an account which was opened online. For more information, talk to your bank.